How many franchises can claim to have made four films, now a fifth, and assuredly believe their picture will make around $250 million at the domestic box office, and about a billion worldwide? J.K. Rowling devotees can thankfully rely on the author’s power and control over her material to influence any filmmaker. Rowling’s content drives the Harry Potter pictures, so even if directed and adapted without the skill of master filmmakers, at least we can count on the story. Steve Cloves, writer of Harry Potter films 1-4, worked closely with Rowling as she fine-tuned his scripts, condensing sometimes more than a thousand novel pages into a mere 150-page screenplay. Cloves goes curiously absent on the credits for Harry Potter and the Order of the Phoenix. Michael Goldenberg wrote the script instead, the only similar work of his being 2003’s Peter Pan film that applied subtle sexuality and harsh violence to J.M. Barrie’s classic fairy tale. Goldenberg has a similar job with this movie; take a modern classic story, which has gone from whimsically idealist to magnificently dark within four films, and places onto this story an adult twist. “Adult” is not meant to suggest anything inappropriate for children, rather just that Harry has obviously become a young man (he even gets his first kiss in the film). Goldenberg doesn’t have Cloves’ magic touch with Rowling’s material, so with great anticipation you should know that Cloves is returning as screenwriter for Harry Potter 6. But for now, Goldenberg’s script primarily deals with politics and conspiracy, big ideas for young readers and viewers, who, if they’ve followed the growing series, like Harry are teenagers by now. The last film culminated with the dreaded moment of Voldemort’s return. This is recalled when someone, presumably working for the Dark Lord, orders Dementors to attack Harry in a muggle community. Goldenberg’s script wades in foreboding evil, telling an intense thriller yarn by creating alarm from the earliest scenes. Maybe that’s why I don’t understand fellow critics like Roger Ebert who complain that the “delight” is gone from the series with this latest movie, as if Harry is supposed to remain an idealistic child even though the guy who killed his parents is now back from the dead and after him. Harry’s fifth year at Hogwarts finds him suspected of lying to the Ministry of Magic about Voldemort’s return and that he used the Patronus Charm in front of a muggle (yeah, to ward off Dementors…). Minister Fudge refuses to accept, even from Dumbledore (Michael Gambon), that the Dark Lord has come back. Keeping an eye on both Dumbledore and Potter is Ministry lapdog and Potter skeptic Dolores Umbridge, assigned to Hogwarts’ annually vacant Defense Against the Dark Arts instructor position. Played by actress Imelda Staunton (Vera Drake), Umbridge is an uppity traditionalist, bound to archaic ministry rules establish centuries ago. Staunton gives her dialogue a wicked articulation, annunciating every syllable so that it’s mutated into something sinister through her tone of voice. Contrasting the other professors’ black robes and cloaks with her snooty pink suit, Umbridge sips her tea, admires her kitten stationary, and recites Ministry law as if it were the only language she knows. The role, in a way, is more despicably evil than even Voldemort himself. She believes defense against dark magic should be a theoretical course, one where actual magic isn’t used. The students don’t see the logic in that, since they won’t be able to defend themselves from Voldemort with theory. When Harry speaks up against this, Umbridge clamps down on Hogwarts’ habitually liberal lesson plan and humiliates Harry in front of the class by saying he’s lying about Voldemort’s return. A later scene shows us Harry’s punishment: he’s forced to write “I must not tell lies” on parchment, which then transfers this lettering into deep incisions on the back of his hand—a cruel punishment straight out of Kafka’s In the Penal Colony. Umbridge is an exceedingly strong villain, someone so straightforwardly unjust and bureaucratic, while also lacking the shadowy mystery of Voldemort, so that her nastiness is blatantly apparent. In response to Voldemort, Dumbledore once again assembles the Order of the Phoenix, a secret band of wizards united to stop the Dark Lord and protect Harry. When Dumbledore eventually loses his Hogwarts authority to Umbridge, Harry rebels by teaching fellow students how to fight the imminent doom, preparing his peers (those who believe his story) for a possible upcoming battle with Voldemort’s evil forces. My favorites have always been Rowling’s tormented heroes: David Thewlis as the cursed werewolf Professor Lupin, or the hulking paranoia of ‘Mad-Eye’ Moody as portrayed by Brendan Gleeson—both characters seeing little screentime in this film. In his own way, even Alan Rickman’s frustratingly ambiguous performance as Severus Snape is heroic. We have yet to discover Snape’s true loyalties, but we do see a glimpse into his past in this film, making him somehow vulnerable—the repercussions of which could make Snape either more sympathetic or more dangerous. Gary Oldman’s Sirius Black makes another significant appearance. His fireplace cameo in Goblet of Fire was hardly enough to sustain joy for this complex character after Prisoner of Azkaban. He’s become Harry’s surrogate father now, possibly the only reason Harry doesn’t feel alone—his purpose is all the more significant because of it. Oldman plays him as understanding, loving, and powerful, but haunted by a horrible past. In Goblet of Fire, Ralph Fiennes embodied Voldemort, giving the kind of five-minute cameo that earns people like Judi Dench Best-Supporting Oscars. His role in this movie is reduced to looking frightening in Harry’s head, or whispering a few creepy lines in the finale—an impressively constructed, multi-wizard battle. But it’s a star role; he’s the guy everyone talks about throughout the picture, building anticipation, until he finally and satisfyingly appears. Fiennes’ talent would have been better utilized actually delivering lines in his animated way, as opposed to simply looking scary. All of Hogwarts’ students have returned per usual, with one addition that we haven’t yet seen in the Potter films: Luna Lovegood, a dreamy, mysterious student Hermione accidentally refers to as “Loony”. 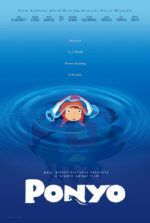 Played by first-time actress Evanna Lynch, the character is so perfectly performed and conceived that her mysterious presence onscreen is only matched by the character’s oddity (Luna’s paranoia about the nonexistent creatures called “nargles” raises the collective eyebrows of her fellow students). Aside from new students, we also have a new director. I remember reading that David Yates would be directing the fifth Harry Potter film. Who is David Yates, I asked myself. I immediately went to imdb.com to see what he had done. Hmmm… nothing much of anything. A few made-for-TV movies and a film or two nobody saw. Tens of millions will see Order of the Phoenix, however. 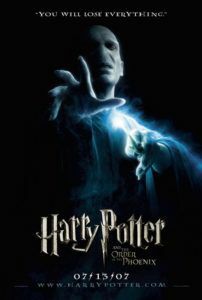 And they’ll see Yates’ work on the next Potter movie, Half-Blood Prince, which is due November 2008. Yates, unfortunately, delivers an unpolished movie, somehow small and common in comparison to its predecessors, as if Harry Potter were nothing more than a supernatural thriller. Yates’ style didn’t fit with this movie’s grand political subterfuge narrative and eventful finish. Flashback scenes into Harry’s memory are rapidly cut combinations of dark clouds, shots from previous films, and images of Voldemort hissing. In no way should a Harry Potter film need to cut corners, and yet Yates made it seem like Warner Bros. was on a tight budget when constructing such moments. The other four films all had grandiosity embedded into their visual presentation; even in small scenes with the Dursleys the image was visually big. Here, Yates makes even Hogwarts seem small. Little of the joyous, blind embrace of Rowling’s wondrous magic world remains, a trait that was almost excessively underlined in the first two entries. Harry Potter has become more than a children’s story since Prisoner of Azkaban; it’s now a mystical thriller for all ages, perhaps pointedly not for little children (see Goblet of Fire and Order of the Phoenix’s PG-13 ratings), supported with an iconic hero and several deplorable villains. 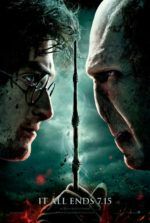 Like every great fantasy, the final conflict has been built-up, and while Order of the Phoenix doesn’t resolve much in the Harry vs. Voldemort conflict, it anticipates with an awe-inspiring suspense. I can only hope that Yates has learned more about blockbuster filmmaking from this experience, so when Cloves returns for Half-Blood Prince the mistakes made here will then be easily avoidable. 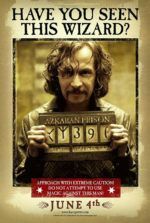 For all the film’s faults, there’s a lot to love, particularly those scenes involving Ubridge, Lovegood, and Sirius Black—some of the best characters in this saga. Rowling’s book may not have been done justice the way the last two Potter films honored their respective books, but it’s a worthy film in this series.